This roadmap for guiding Committee decisions should be reviewed at least annually. If you don’t have one, you would be surprised how helpful having written principles can be. Update the peer group for relevancy. Gather compensation data from surveys and proxies. Board/Committee review of CEO performance; and CEO review and report on other senior officers. Committee review of CEO salary and adjust based on market/peer pay levels and executive job performance. Committee review of CEO recommendations for other senior officers. Update plan in terms of participation, payout ranges, objectives, weights, and performance ranges. Review performance and potential payout levels at mid-year. Complete end-of-year review and approve payouts. Review existing grants and remaining share reserve. Determine any need for updating plan and/or share reserve. Determine new grant (type of grant, total shares, terms, CEO allocation). Review and approve CEO recommendation for grants to other officers. Conduct at least annually – ideally just after the end of the year so the Committee can look back at the prior year and plan for the year just beginning. Determine frequency of review (we recommend an annual review; but at least every third year as a minimum). Conduct review and recommend changes to Board. Of course, companies participating in government programs like TARP or those who are required to report to the SEC have a number of other requirements and activities that we won’t try to cover here. Suffice it to say that these requirements are a significant expansion of the previous list. 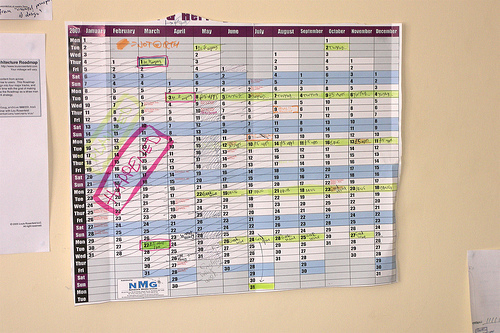 Filling out the calendar is best done using a grid with the major categories of work down the left side of the calendar, and the months across the top. This approach allows you to schedule the items in each category in logical order as well as look at the volume of Committee work in each month. Finally, this is a task best completed by the Committee Chair, CEO, and outside compensation consultant if you have one. You may also want your CFO and Chief Human Resources Officer involved if they interact directly with the Committee. Please add comments below, and if you want to know more about how we can help, call me at 919-644-6962 or ask us to contact you at http://matthewsyoung.com/contact.htm. In a previous blog entry, I talked about improving Executive Compensation Committee Effectiveness by setting up an annual Committee calendar to balance workload, set priorities, and ensure timely and effective decisions. Some Director backgrounds are more appropriate than others for the Compensation Committee. Candidates with formal corporate management experience or service as professional directors tend to have a better perspective for dealing with complex compensation issues. Directors with entrepreneurial or smaller company experience may not have faced these kinds of issues before. Our experience shows that the Compensation Committee needs at least three independent members but typically not more than five. Decision-making is streamlined with a smaller committee; but don’t get so small that you limit important interaction and having a range of perspectives that ultimately builds strong consensus. Also, you should change no more than one-third of the committee’s members in a year. Otherwise, you lose “institutional memory” and valuable experience and expertise that takes a while to develop. Because of the importance placed on the governance of executive compensation, membership on the Compensation Committee should be a director’s primary committee assignment. If at all possible, don’t place directors on both the Compensation and Audit Committees. While you want your best directors on your most critical committees, you don’t want to stretch them too thin. And finally, all Boards of Directors should take the time to determine what level of authority the Compensation Committee will hold. We believe that Compensation Committees are most effective when the Board assigns them specific decision-making authority. Where full Board voting is desired or required, the Committee should always bring a specific recommendation that the Committee has developed and fully supports. Personally, I don’t know how “independence” can be anything other than “neutral”…this seems a little redundant, but I digress. The SEC is required to adopt the new rules by July of 2011 (within one year of the law being signed). The rules will require that public companies disclose in their proxy when they hire an outside compensation consultant, whether potential conflicts of interest exist (in other words – if the consultant has a personal preference or is potentially subject to control by others) and what the Committee has done to address the potential conflict. This will obviously influence Committee behavior in hiring such advisors by encouraging them to avoid any potential conflicts or breaches of neutrality and independence. In only the most extreme cases, could a Committee justify hiring an advisor that violates the independence test without public scrutiny and shareholder unrest. Much like Sarbanes-Oxley’s requirements of independence and neutrality with regard to Audit Committee advisors, these new rules on corporate governance seem to fall into the category of “doing the right thing”. Some consulting activities that seem to contradict this characteristic would be selling products to companies whom you advise, simultaneously working for management on other projects without full disclosure and prior approval of the Committee or an engagement advising companies for fees where the consulting principals have a significant ownership position (i.e. shareholder). At Matthews-Young, we have always subscribed to the higher ideal of “doing the right thing”. We require that we be hired and report directly to the Compensation Committee when we are engaged for Executive Compensation work. We have no sources of revenue other than being paid for our time and knowledgeable, expert advice without “supporting or favoring either side”. If we can assist you with improving your company’s governance and committee effectiveness please give us a call at 919-644-6962 or ask us to contact you at http://matthewsyoung.com/contact.htm. "Our Succession Committee Board Members have been extremely pleased with the services provided by Tim and his staff. He has been the perfect person to support our (BOD and staff) through this process. We are most appreciative of his deep expertise, understanding of our culture and responsiveness to our particular needs."